Open a shapefile in R using readOGR(). 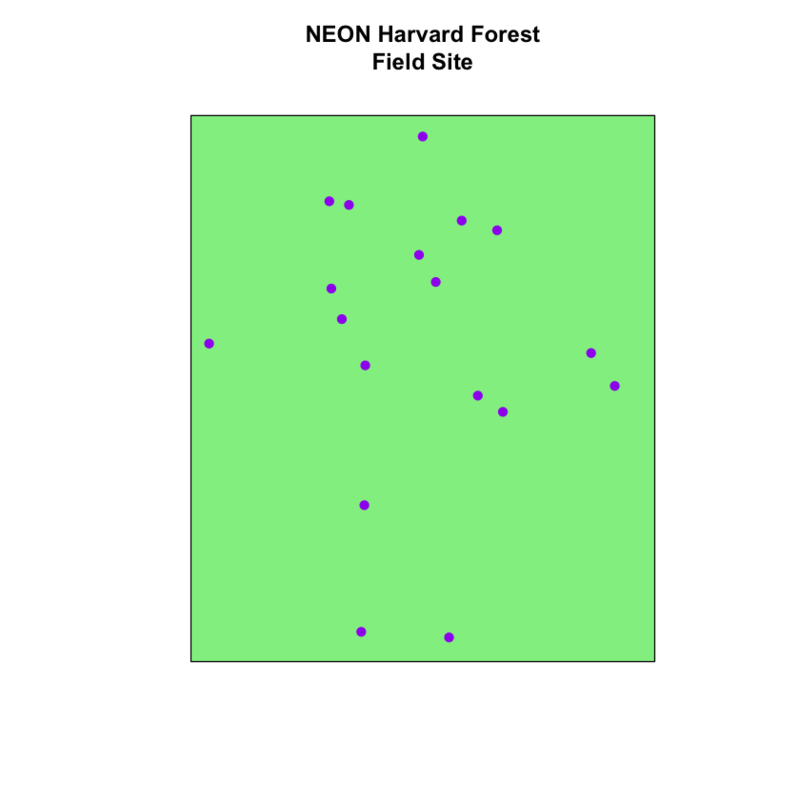 Access the tabular (data.frame) attributes of a vector spatial layer in R.
Vector data are composed of discrete geometric locations (x,y values) known as vertices that define the “shape” of the spatial object. 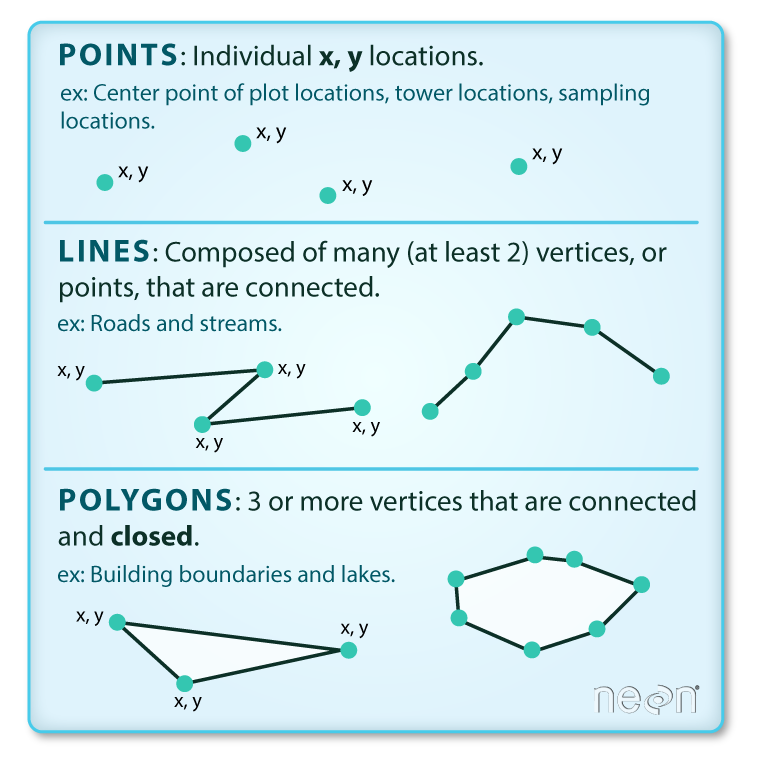 The organization of the vertices, determines the type of vector that you are working with: point, line or polygon. Data Tip: Sometimes boundary layers such as states and countries, are stored as lines rather than polygons. However, these boundaries, when represented as a line, will not create a closed object with a defined “area” that can be “filled”. You will use the rgdal package to work with vector data in R. Notice that the sp package automatically loads when rgdal is loaded. You will also load the raster package so you can explore raster and vector spatial metadata using similar commands. # work with spatial data; sp package will load with rgdal. A polygon shapefile representing your field site boundary. A line shapefile representing roads. A point shapefile representing the location of field sites located at the San Joachin field site. The first shapefile that you will open contains the point locations where trees have been measured at the study site. The data are stored in shapefile format. To import shapefiles you use the R function readOGR(). The directory where your shapefile lives: data/week-04/D17-California/SJER/vector_data/. The name of the shapefile (without the extension): SJER_plot_centroids. 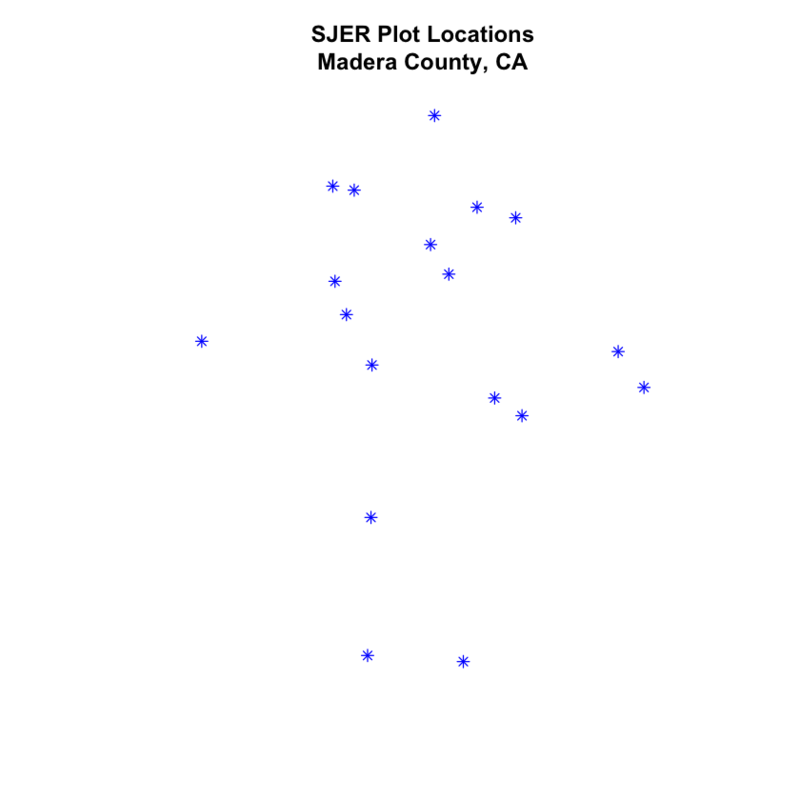 ## Source: "/Users/lewa8222/Dropbox/earth-analytics/data/week-04/california/SJER/vector_data", layer: "SJER_plot_centroids"
When you import the SJER_plot_centroids shapefile layer into R the readOGR() function automatically stores information about the data. You are particularly interested in the geospatial metadata, describing the format, CRS, extent, and other components of the vector data, and the attributes which describe properties associated with each individual vector object. Your sjer_plot_locations object is a polygon of class SpatialPointsDataFrame, in the CRS UTM zone 18N. The CRS is critical to interpreting the object extent values as it specifies units. Each object in a shapefile has one or more attributes associated with it. 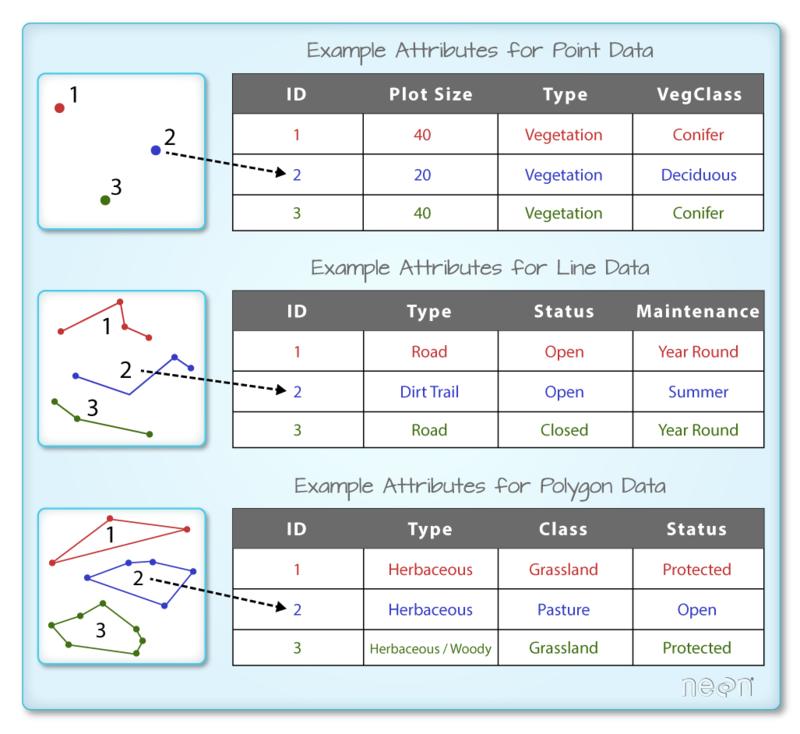 Shapefile attributes are similar to fields or columns in a spreadsheet. Each row in the spreadsheet has a set of columns associated with it that describe the row element. In the case of a shapefile, each row represents a spatial object - for example, a road, represented as a line in a line shapefile, will have one “row” of attributes associated with it. These attributes can include different types of information that describe objects stored within a shapefile. Thus, your road, may have a name, length, number of lanes, speed limit, type of road and other attributes stored with it. You view the attributes of a SpatialPointsDataFrame using objectName@data (e.g., sjer_plot_locations@data). In this case, your polygon object only has one attribute: id. You can view a metadata & attribute summary of each shapefile by entering the name of the R object in the console. Note that the metadata output includes the class, the number of features, the extent, and the coordinate reference system (crs) of the R object. The last two lines of summary show a preview of the R object attributes. Next, let’s visualize the data in your R spatialpointsdataframe object using plot(). Using the steps above, import the data/week-04/california/madera-county-roads/tl_2013_06039_roads and data/week-04/california/SJER/vector_data/SJER_crop.shp shapefiles into R. Call the roads object sjer_roads and the crop layer sjer_crop_extent. The plot() function can be used to plot spatial objects. Use the following arguments to add a title to your plot and to layer several spatial objects on top of each other in your plot. add = TRUE: overlay a shapefile or raster on top the existing plot. This argument mimics layers in a typical GIS application like QGIS. main = "": add a title to the plot. To add a line break to your title, use \n where the line break should occur. Import the madera-county-roads layer. Plot the roads. Next, try to plot the roads on top of the SJER crop extent. What happens? Check the CRS of both layers. What do you notice?